The family of Jean McElgunn, with much sorrow, announces her passing on October 1, 2017 in Kamloops. Jean was born in London, England on August 10, 1924, to parents Reginald and Olive (Robina) Cook. She is predeceased by her parents, her siblings, Russell, Eileen, Brenda and John. 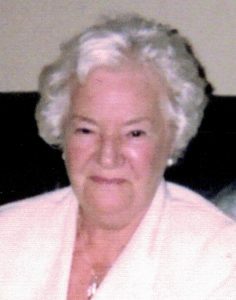 Also predeceased by her husband Douglas Francis (Pat) McElgunn and by her beloved daughter Ann McElgunn. She is survived by her children, Michael (Linda) McElgunn and Barbara McElgunn, grandchildren Kirsten (Trevor) Christianson, Brandy (Anthony) Varesi and great grandchildren Paige, Riley and Devin as well as various relatives in England. Mum grew up in war time London. As a young girl, she was one of many that were evacuated to the countryside to escape the bombing Blitz of London. She and her family spent many evenings in total darkness in an air raid shelter in their backyard. 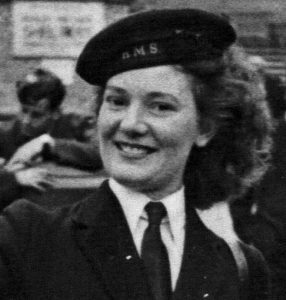 At the age of 18, she joined the Wrens, Women’s Royal Navy Service. Mum was stationed in various locales in in England and spent the last year in Ceylon, now known as Sri Lanka, helping the mopping up operations of the headquarters for Britain’s Southeast Asia command. In contrast to the dark years of the war, this posting was much more pleasant. There was a huge sense of relief that the war had ended and people were able to relax and enjoy normal lives again. Jean came to Canada to rejoin her future husband Pat in 1946. She crossed the Atlantic Ocean by ship to Halifax and travelled across Canada to Kamloops by train, leaving all of her family behind. For a time, she helped Pat with the work at a fishing camp at Peterhope Lake that Pat had purchased. Eventually, Jean obtained employment in Kamloops at the Royalite refinery in Brocklehurst which then became BA Oil and finally Gulf. In all, she worked at the refinery for 23 years, taking early retirement at age 59. She made many lifelong friends. After retirement, mum was able to spend more time gardening. She especially loved her roses. She also volunteered for many years for the Women’s Afternoon Auxiliary for RIH, eventually becoming President. She made many friends there and enjoyed travelling on Auxiliary business. Leaving her Brocklehurst home in 1996, she moved out to a new development in Westsyde called the Dunes. Mum loved it there and despite space limitations, once again had a beautiful rose garden. Every summer, she had many pots full of colorful flowers that she loved to look at. She remained there until her passing. What can be said about our mum. She was loving, caring, generous, funny, intelligent and had a wonderfully wicked sense of dry British humour. She was always there to lend an ear or a shoulder to cry on. She was a great cook and the best pie maker ever. Ever the Englishwoman, she loved her tea. She was always a lady. The family would like to thank all of mum’s wonderful neighbours who were always there for her when she needed them, most recently Edna, Barbara and Dan. She so much appreciated their friendship and help. Her departure was sudden and unexpected and we all miss her terribly. Her family was there until the end. You never know what tomorrow will bring so make sure to hug your dear ones daily and tell them you love them. There will be no service, however, there will be a memorial celebration of her life in the Spring of 2018, mum’s favorite season, date to be announced. You will always be in our hearts mum, we miss you and love you. Always gracious, our world today seems to be lacking people with these qualities but she will leave this legacy to all those she encountered in her life. She will be a sad loss to her family and friends. Our deepest condolences go out to the McElgunn Family. My father, Kelly Carin, worked with Jean at the Refinery for probably 20 years. Then miraculously, my Mom and Dad bought the other half of the duplex that Jean lived in at the Dunes. Being reunited offered the opportunity for their friendship to grow even stronger and the 3 of them spent many an evening having cocktails on the patio. (Of course, Jean would have a water) Jean, Kelly, Doreen and our family enjoyed years of friendship and Jean was the best neighbour my Mom and Dad could have asked for. Jean was such a lovely person. Always happy to see us and invested in hearing all about our lives. She had the same type of humour as my Dad and you could tell that they were in tune with each other. Just like my Mom, she exemplified a true lady in every way. My Mom and Jean became fast friends and they were always there for each other. I know Jean will be missed by all who loved her but knowing Jean, I bet she was ready to leave this world when the time came. A final fairwell to one of the nicest Ladies you could ever meet.